Sunday night we couldn't decide on where to go and we finally came to the conclusion of Sushi Nara, which offers all you can eat on Sundays and Wednesdays only. 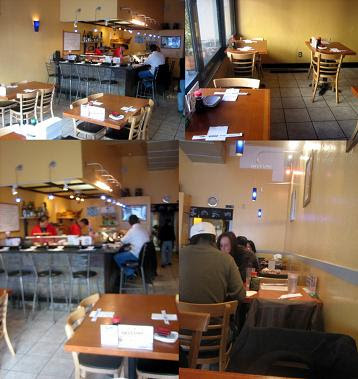 We read online that they had an all you can eat for $20 but the service was suppose to be horrible. Their website does not show the choices alloted for the all you can eat menu. They actually have a decent amount to choose from. Due to higher food costs, they have raised their prices to be $23 per person. As we were driving to Sushi Nara I noticed that the surroundings looked very familiar and low & behold it was located right next to the Swan Oyster Depot (I still have to post about that place). The interior was very simplistic. We went early so it seemed deserted and a lot of open room. As time went on, the place got very crowded and seemed a lot smaller. I guess you can give this place a Q, there were mostly men there ordering the all you can eat. Ms. Lin and I commented that this would be a good place to find men, although I wonder how many weren't couples themselves. O=9 Hey we are in SF! There was this one couple where one guy had those new fad earrings for guys and his ears looked like Buddah! It was kind of scary, I swear the earlobes hung down like Buddah! They let you order everything at once and then you can order more later on. We decided to get one of each appetizer. My favorite item was the Chicken Karrage. 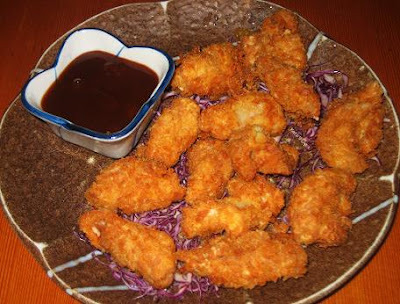 It was tender dark meat chicken breaded with bread crumbs and fried to perfection. They gave the typical tonkatsu sauce for dipping. We ordered the Gyoza, Koroket, and Tempura. Their gyoza was decent and fried to extreme crispiness, but I felt the flavor was lacking. Ms. Lin thought they were good, maybe I am a harsher critic. We both didn't like the croquettes. They were decent but I felt the potato wasn't as creamy or flavor as it could be. 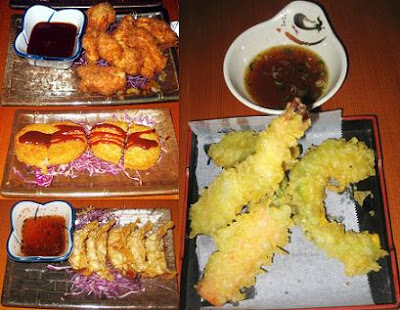 The tempura mix was a little heavily coated for my taste and the tempura sauce was a little different from what you usually get in other Japanese restaurant. They probably added ginger and vinegar for more of a kick, but I prefer the classic tempura dipping sauce. We decided to try a few nigiris. The Shiro Maguro (White Tuna) was pretty good and had a soft texture. 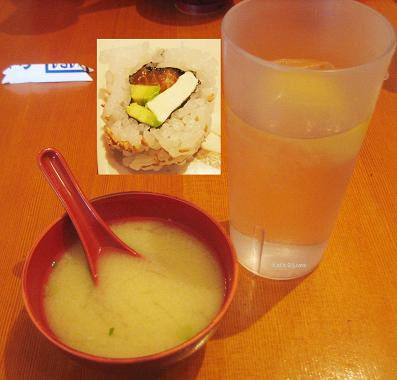 The Hotate (Scallop) and the Unagi (Fresh Water Eel) was decent. As for the Sake (Salmon) it was not very fresh, the tasted and texture were off. Let's just say that the fish here was not the freshest, but hey what do you expect from an all you can eat place at a price of $23 per person in SF! 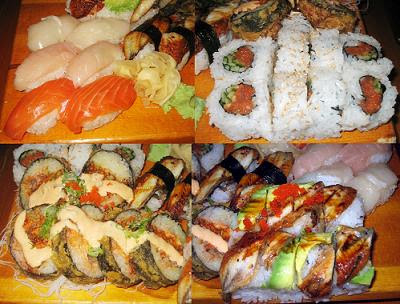 We ordered a few rolls to try since they looked interesting. I got the Black Tiger with avocado & eel over a roll of cucumber and fried crab. The combination was not bad but for some odd reason they added some sauce that made the rice almost unbearably sour. Ms. Lin ordered the Spicy Crispy Roll with fried tuna, salmon, avocado drizzled with spicy sauce. She also ordered the Spicy Tuna Roll. They were not bad, but nothing to die for. I did think they were spicy. The crispy roll was fried a little to crisp that it ended up scraping the roof of your mouth. I ended the night with more yummy Chicken Karrage, I think this would be my favorite thing at this place.